How many ‘conspiracies’ must be proven true before you believe what is happening? It is difficult to believe that our planet has been weaponized before our very eyes, but that is exactly what has happened. First, we were seduced by the convenience of a wireless world; then, atmospheric weather experimentation in the guise of carbons “climate change” converted the air we breathe into an antenna. Now, the geo-engineering we’ve been subjected to for two decades is being normalized as the “Star Wars” Space Fence rises around and within us. Inside the electromagnetic lockdown of the Space Fence, humanity is to be neurologically herded toward a Transhumanist future. Is this the Space Age we were promised? 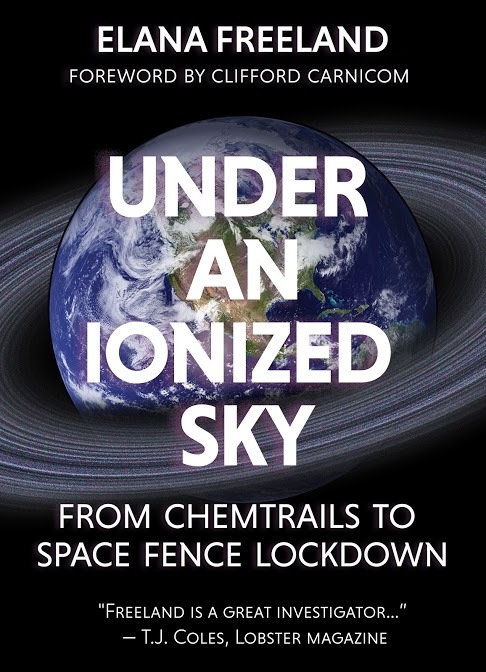 In June 2014, Feral House published Freeland’s bestselling, Chemtrails, HAARP, and the Full Spectrum Dominance of Planet Earth, the book that connects how the chemical aerosols whiting out our skies and ionospheric heaters around the world work together to assure seven major military operations of global control. Under An Ionized Sky is the long-awaited sequel. Elana Freeland has been a Waldorf school pioneer, teacher, lecturer, storyteller, and writer. She has written for alternative publications, edited the stories of survivors of MK-ULTRA and ritual abuse, and ghostwritten books on diverse topics. Her second major in college was biology. In 1996, she was awarded a Master of Arts in Great Books and honors for her thesis on historiography at St. John’s College in Santa Fe, New Mexico.